Aerodynamic and high-performance engine testing at NASA's Kennedy Space Center in Florida recently saw the record for fastest production car in the world pass to Hennessey Performance following a 270.49-mph run at Kennedy's Shuttle Landing Facility (SLF) on Feb. 14. Outfitted with a suite of accelerometers and GPS receivers that would make a rocket engineer proud, the Hennessey Venom GT was able to collect precise information to confirm the car's safety and handling throughout its performance regime. Without the real-world testing, the company could not be sure its computer models and limited evaluations were complete. "The teams that have come here have all said the same thing: there's no substitute for this," said Johnny Bohmer of Performance Power LLC. "They go to wind tunnels that cost $5,000 an hour. They'll do 10 million laps on simulated computer programs, and then they come out here and it's all wrong. This runway is a tool, and it's the right tool." Hennessey worked with Johnny Bohmer of Performance Power LLC in West Palm Beach, FL, to use the NASA facility. Bohmer negotiated a Space Act Agreement with NASA to evaluate aerodynamic principles on cars using the runway. Testing the American-made car at such extremes in speed is only possible in a few places in the world, and the 3.2-mile-long, 300-ft-wide runway at the SLF was chosen because its concrete surface and expanse gives drivers confidence they can perform their trials safely. 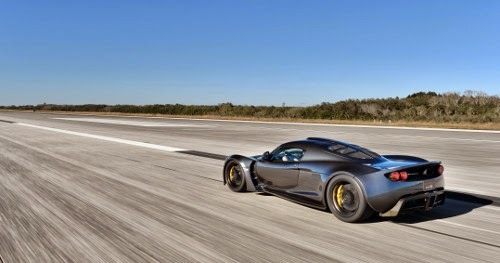 "Validating the Venom GT's performance, stability, and safety on such an incredible runway is why we came here," said John Hennessey, owner of the Seeley, Texas-based auto maker. "I wanted to be an astronaut when I was a kid. Neil Armstrong was my childhood hero. Even though the astronaut thing didn't work out for me, I am humbled to have had the opportunity to conduct our testing on the hallowed grounds of the Kennedy Space Center." All the cars that are tested at Kennedy have to record measurable engineering data as part of their agreement. It's not a joy ride, in other words. The information that automakers and race teams gather doesn't have to be shared, but it's expected to feed into future innovations and ultimately improve everyday cars at some point. Speaking in January during the first trip by Hennessey to try out the Kennedy surface, both auto makers said there are not many places in the world to safely perform the critical evaluations that give them the confidence to sell their vehicles to the public. "You can do all the modeling programs you want, you can do all the simulations and computers, but you have to go out and hit the real world," Bohmer said. "Now if somebody goes out in the car and wants to push the car, he knows the car will be safe."